The movie title is making everyone ask, “What the heck is Shurarabon? ?” It’s not a normal Japanese word, but knowing that the movie was filmed almost entirely in Shiga Prefecture was enough for me to see the movie (and read the manga) to find out. Overall, I thought the movie was good and worth seeing especially if you know Shiga. The story, casting, special effects, and Shiga scenery came together well enough. For us Shiga people, it’s a movie to gleefully exclaim, “I know where that is!” or “I’ve been there!” Indeed, many familiar places appear in the film unlike last year’s Time Scoop Hunter (about Azuchi Castle) that showed few recognizable places in Shiga. The cast and crew spent one month in Shiga in spring 2013 filming the movie. Much of it was filmed in and around Hikone Castle. Another major spot was Chikubushima (pronounced correctly most of the time, except once when it was pronounced “Chikubujima”). We also see the inside of Daitsuji temple in Nagahama, Himure Hachimangu Shrine and Omi Kyodaisha Gakuen in Omi-Hachiman, Omi Shonin-tei restaurant in Aisho, Maiami-hama beach in Yasu, and stately Rokkaen in Kuwana, Mie Pref. It was all on-location and they didn’t shoot in any movie studio. This movie review doesn’t have any plot spoilers so you can still read on even if you haven’t seen the movie yet. Based on the novel by Osaka-born Makime Manabu (万城目学), Idai Naru, Shurarabon is a modern-day fantasy story centering on two feuding Lake Biwa (Biwako) lakeside clans, the Hinode Clan (日出家) and Natsume Clan (棗家). Key members of both clans have supernatural powers gained and retained from the divine water of Lake Biwa, Japan’s largest lake and greatest “power spot.” If they move away from Lake Biwa, they lose their powers. Once upon a time, other lakeside clans (called Lake People) at other lakes in Japan existed, but those lakes lost their power and so their Lake People also lost their powers. The Hinode Clan’s main family is Japan’s only family to live in a castle. They live in the fictitious Iwabashiri Castle in the fictitious city of Iwabashiri (石走) in eastern Lake Biwa. The castle and city are actually Hikone. Even JR Hikone Station is shown as “Iwabashiri Station” in the movie. The Hinode Clan, led by clan head Hinode Tankuro (日出 淡九郎), has the power to enter a person’s heart and mind and control it. This mind control enabled Tankuro to become a local business tycoon by making his disagreeing opponents agree with him. Many businesses in Iwabashiri bear the Hinode name. Tanjuro, Kiyoko, and Ryosuke enter the castle (Tenbin Yagura). Meanwhile, the Natsume Clan is in decline. Most of its branch family members have been purged from Lake Biwa by Tankuro. Only the main Natsume family is left in Iwabashiri. Clan head Natsume Nagami (棗 永海) runs a martial arts dojo. The Natsume Clan has the power to control a person’s physical actions and can also manipulate time. So they are good at stopping fist fights, etc. One big drawback is, whenever a supernatural Hinode clan member uses his/her power, supernatural Natsume clan members will hear a great big noise (SHU RA RA RA!!). And vice versa. Whenever a supernatural Natsume clan member uses his power, supernatural Hinode clan members will hear a thunderous noise (BO-BO-BON!!). Another reason why they don’t like each other. Ryosuke hearing the dreaded noise as Natsume Hiromi uses his power. Shortly after birth, Lake People babies undergo a religious ceremony at Chikubushima to determine whether he or she has supernatural powers (chikara). If the baby has the power, it is given a first name that includes no more than one kanji character having the sanzui radical for “water” such as 涼介 (Ryosuke), 淡十郎 (Tanjuro), 清子 (Kiyoko), and 広海 (Hiromi). In the movie, those with supernatural powers also bear a birthmark in the shape of Lake Biwa. This power also cannot be revealed to common folks, making it a childhood burden. The movie begins with 15-year-old Hinode Ryosuke, the main character (played by Okada Masaki), arriving at Iwabashiri Castle for a home stay to hone his supernatural powers under the main Hinode family. Ryosuke is from a branch family of the Hinode living on the opposite side of the lake on the western shore. Hinode Clan tradition stipulates that all supernatural Hinode Clan members spend their three high school years at the main family’s residence (Iwabashiri Castle) to train. Ryosuke arrived in April (cherry blossom season), the day before the start of high school. While attending high school (named Iwabashiri Gakuen), Ryosuke is trained at the castle. The main Hinode family’s heir is another 15-year-old, Tanjuro, the son of clan head and business tycoon Tankuro (Sano Shiro). Tanjuro is an eccentric, spoiled brat, and treated like a lord and living legend with exceptional powers. Although he is depicted as short and chubby in the novel, he is quite slim in the movie played by Hamada Gaku. Ryosuke and Tanjuro commute to school driven by boat man Genjiro. Ryosuke is Tanjuro’s distant cousin and a normal teenager except for his powers. He becomes a slave-like attendant to Tanjuro. 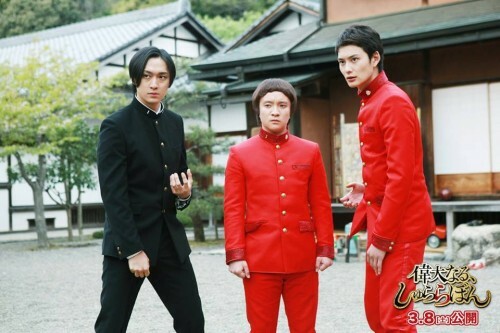 Ryosuke and Tanjuro commute to their high school (filmed at the gate of Shiga University and the classroom and grounds of Omi Kyodaisha Gakuen) via moat boat in hilarious red school uniforms. Red is Tanjuro’s favorite color, but I saw it as a salute to the Ii Clan’s trademark red samurai armor. The school uniform for boys was actually black. For 1,300 years, the Hinode and Natsume clans have been rivals feuding over their supernatural powers. Hinode heir Tanjuro wants to forfeit his inherited powers and end the feud. He arranges a meeting with Natsume Hiromi (Dai Watanabe), his classmate and heir to the Natsume Clan. Tanjuro, Ryosuke, and Hiromi are all in the same high school class. They meet at the Natsume Clan’s dojo (filmed at Omi Shonin-tei in Aisho) and Tanjuro proposes that he and Hiromi both leave Lake Biwa to pursue their personal interests. Since they will both lose their powers, the feud would stop. Although the manga mentions that Tanjuro would go to France to pursue art and Hiromi should go to Italy to study fashion, the places they would move to is not mentioned in the movie. Of course, both their families fiercely opposed this proposal. However, a third force with overwhelming powers comes into play, bringing together the two heirs and Ryosuke to fight off the third force. There are some good special visual effects here. Classmates Natsume Hiromi, Hinode Tanjuro, and Hinode Ryosuke team up (Hikone Castle Museum). The story has quite a few supporting characters, but the movie is too short to fully develop and explore all of them. There’s Kiyoko, Tanjuro’s tough older sister who got stressed out by the noise of people’s thoughts and confined herself to the castle. She’s supposed to be chubby, but actress Fukada Kyoko is slim. High school delinquent Kasai (Koyanagi Yu) was funny and Natsume Clan head Nagami (Takada Nobuhiko) had excellent on-screen presence. Wish we could’ve seen more of them in the movie. The Hinode clan’s boat man, Genjiro, was cast well with Sasano Takashi. Fujimiya Toko (Kanjiya Shihori) is Ryosuke’s busybody power trainer with only one memorable scene using a rubber ducky. Another major supporting role was high school principal Hayase Yoshiharu (Murakami Hiroaki). Wish we heard more about his background as a member of the Hayase Clan who originally lived in the castle until they sold it to the Hinode family. And Ryosuke’s brother Kosuke doesn’t appear at all in the film. The movie omits or abbreviates many scenes and elements from the original story. Even the manga introduces quite a few Shiga things like the Lake Biwa Giant Catfish and the board game Carrom (カロム), popular in eastern Shiga (Hikone). But we hardly see it in the movie. Too bad they can’t make movies longer than 2 hours. Since the film pretty much whipped through the storyline, it would be worth reading the novel too. But it’s still entertaining for us to see Shiga on the silver screen. The Shiga Location Office’s blog has a good collection of photos and anecdotes about the filming locations. 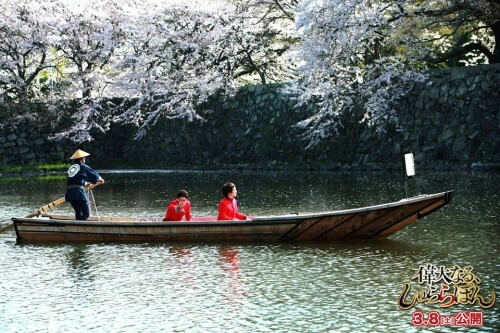 It says that the moat boat scene with Tanjuro and Ryosuke commuting to school amid cherry blossoms was filmed in the early morning before the arrival of the hordes of tourists coming to see the cherries. The extras used in the high school scenes were students from Hikone Higashi High School next to Hikone Castle and near Shiga University. The school’s interior scenes were shot at Omi Kyodaisha High School over three days. When they shot the Natsume dojo scene at Omi Shonin-tei restaurant, the classy restaurant treated them to a sumptuous lunch of Lake Biwa carp. For the special effects scene with the horse running through the lake, they set up a huge green screen in Moriyama. Not only that, they brought over live Lake Biwa carp fish (koi and funa) to wiggle around in the scene. (At first I thought the fish were computer graphics.) For the scene showing Chikubushima’s underwater cliff, they filmed the face of a huge stone quarry in Koka. I don’t think I’ll have time to read the long Japanese novel, but there is an English version of the novel which I plan to read and review here. The Great Kiyoko at Maiami-hama beach. Makime was born in 1976 in Osaka where he grew up. He graduated from Kyoto University. He has written a slew of novels set in the Kansai Region. At least one novel each for Kyoto, Nara, and Osaka. Now it was Shiga’s turn with Idai Naru, Shurarabon. His stories are an interesting mixture of fantasy and local history in a modern-day setting. His previous novel, Princess Toyotomi, set in Osaka, was also made into a movie. Two of the actors in Princess Toyotomi also appear in Idai Naru, Shurarabon. Makime published Idai Naru, Shurarabon in monthly installments from May 2010 to April 2011 in Shosetsu Subaru (小説すばる), a literary magazine published by Shueisha. The installments were then published as a novel. Makime loved eastern Shiga and visited Hikone and Chikubushima many times to research the novel. The concept of people receiving superpowers from the lake’s divine water is an amusing exaggeration of our dependence on Lake Biwa. And the idea of Lake Biwa being Japan’s greatest “power spot” is a good one. I hope this movie will prompt people to visit Lake Biwa to seek or recharge their “power.” It certainly has worked for me. Shiga-only movie ticket with Hiko-nyan. 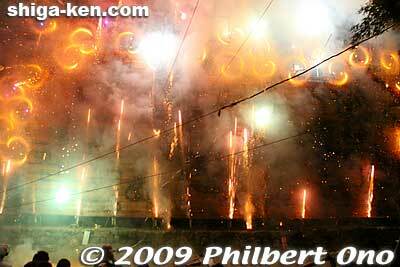 *Japanese personal names above follow the Japanese custom of the surname coming before the given name. *Movie ticket collectors should note that Shiga-only movie tickets with Hiko-nyan pictured with Tanjuro and Ryosuke are being sold at selected vendors in Shiga. They include Hikone Castle and Museum ticket offices and tourist information offices in Hikone and Nagahama. These tickets are good for admission at all theaters in Japan showing the movie.